Summer is the time of year when teachers can enjoy a break from the the highly scheduled daily routines of the school year. It’s also a great time for teachers to engage in professional development to keep up with the challenges of our rapidly changing educational environment and connect with others to build a PLN. I am fortunate and excited to be able to offer a variety of professional development experiences this summer to help teachers embrace change and adjust to the instructional shifts that will ultimately help our students develop the 21st Century Skills necessary for success. Use free and user friendly digital tools to transform learning. Explore, connect with others, and learn together through constructive play as you build a personal learning network. Align learning experiences to the Common Core . Shift instructional practices to focus on student centered collaborative learning that engages students in the 4 C’s. Effectively differentiate and manage the student-centered classroom. Learn more and sign up for professional development in June. I hope to make some new connections this summer and look forward to collaborating with some familiar and talented friends. As another school year comes to a close it’s time for students and teachers to celebrate and reflect on all the wonderful experiences from the school year. 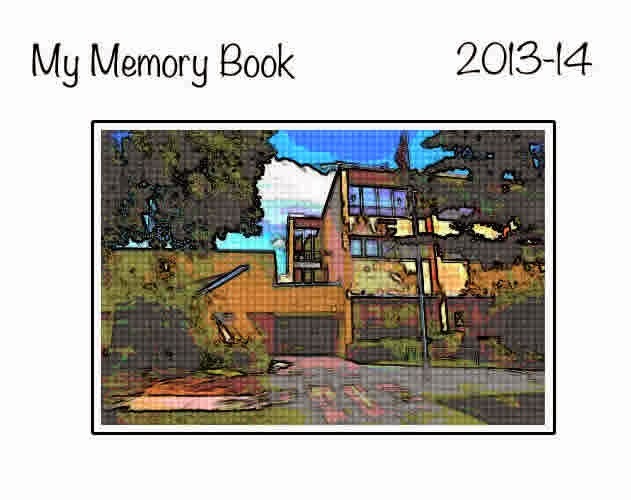 ThingLink is the perfect tool for creating multimedia memory books to help students capture memories, preserve them, and share them with friends and family across the globe. 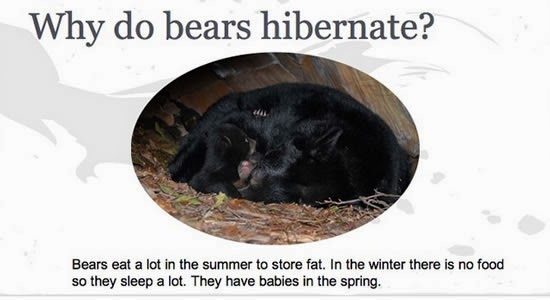 Recently I had the opportunity to work with a group of 7 year olds on a very, very short project about bears. My goal was to help these students learn to problem solve as they engaged in research and writing. I decided to use Google Docs Presentation Slides for this project. 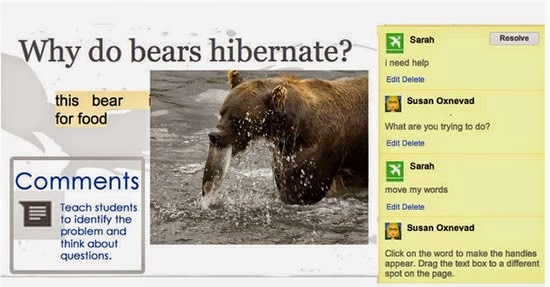 Google Presentation Slides have a handful of built in supports to make it easy for students to research, create and publish without leaving the page, so it is well suited for working with young students with little or no experience creating on a computer. The integrated research tool was useful for teaching students to begin to learn to search without yielding an overwhelming amount of results to sift through. The built in image search helped students easily find and insert images labeled for reuse, and it allowed me to introduce copyright to them. This is a concept I will continue to build on as we work together in the future. Best of all, the sharing feature allowed us to work collaboratively to build one slide show, which set an attainable goal for these little ones. To avoid the pitfalls of total chaos and to keep some of the focus on the content, I decided to encourage these young students to engage in some constructive play and problem solving before they started their own slides. I created a nonsense slide right in front of them and challenged them to fix it, take it apart and add something new to the slide. As I quickly assembled the slide in front of students, I demonstrated how to search for an image, taught them about using “handles” to edit and modify content, and showed them how to scroll over the icons in the menu bar to learn more about their functions. I didn’t expect students to learn how to do these things by watching a demo, I wanted to show them what was possible and model some of the thinking required to accomplish tasks. Here is what the first slide looked like. Challenge: Can you help me fix my slide? On the second day, I set the tone for students to get help with the obstacles they would face when creating their own slide. To maximize instructional time, my goal was to keep them working instead of waiting for me to come around to help them solve their problem. To make the most of the time we had together I taught them how to ask specific questions to identify their problem, as an alternative to “I need help!” After all, it is this type of thinking that will ultimately help students become tech savvy and independent. Those of us who are good at solving our own tech problems know how to search for the answers. Next, I taught them to use the Comments feature in Google Docs to get the questions off of their minds so they could move on and get something accomplished while waiting for help. I’ve learned that students with raised hands waiting for help accomplish little or nothing, and I wanted to avoid that familiar scenario. After this exercise in constructive play it was time to let each student create a slide of their own within our collaborative presentation. 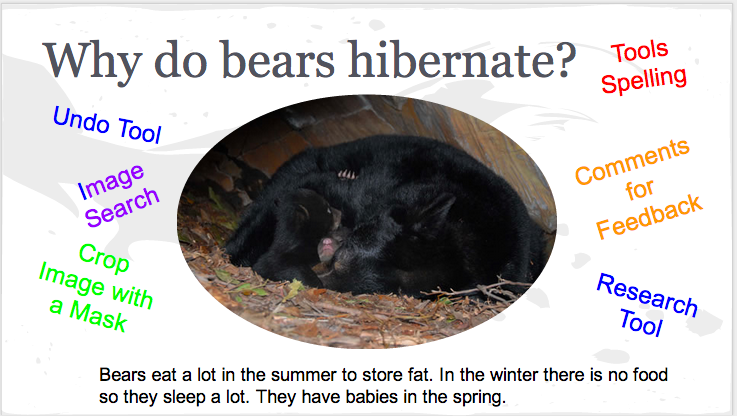 I created a blank slide for each student and asked them to write a question about bears. We spent the next few days learning. They learned to use the research tool to find answers, they learned to think about “search” to find appropriate information and images, they learned to problem-solve, and they learned to use comments for feedback and help. Students developed their own areas of expertise and helped each other throughout our short time together. One student became our images expert and another learned to use the Define Tool to replace boring words with more descriptive terms. They corrected their spelling, struggled with dragging things around through the use of a trackpad, and they learned to use the cropping tool to magically transform the shape of their images. The students took pride in their work, and most of all, they had fun! This is how the practice slide eventually turned out. 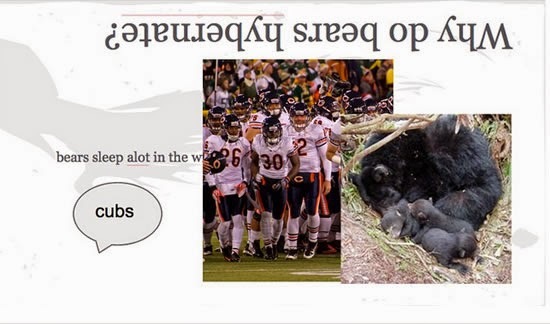 This short project met the instructional goals I set and we ended up with a very basic and imperfect slideshow about bears. The goal of this project was not focused on the end product and we were not trying to impress anyone. The work we did together was focused on empowering students and helping them acquire the thinking skills necessary for creating and sharing information in a digital environment. I’d say this project was a success! Today’s world is complicated – especially as technology continues to disrupt the different fields we have grown so used to living in. We can’t ignore that social media has completely transformed the way in which we receive and understand current events. As this disruption starts to happen in our schools, we need to fully engage parents so that they not only understand, but feel absolutely comfortable with all the school practices and policies. BrandED Podcast– Superintendent Joe Sanfelippo and principal, Tony Sinanis interview innovative educators who are incredible tellers of their school’s story. Make Your School House Rock: 10 Ways Principals Can Use Social Networks for Branding – new post from TreeRing, the innovative personalized yearbook publisher, full of resources and ideas for telling your school’s story effectively. Digital Leadership, by Eric Sheninger– New book for every edleader wondering how to use social media to engage, inform and inspire. (find one review here). Adjusting Course: Responding to the Needs of the 21st Century Student– great blog by Minnesota elementary principal Brad Gustafson, continually sharing how his school tells their story. 10 Ways to Ensure Parents Won’t Need to Ask What Did You Do at School Today?– EdTech ideas for flattening those classroom walls and letting parents in. Lewis Elementary Blog– best example of elementary principal, Tim Lauer, telling the school’s story using a wide range of digital technology in a truly effective manner. About the Author Alison Anderson is a former teacher, tech integrator and now education blog editor. She is active an active member of the EdCampPDX planning team and continually focused on working to improve education for students in Portland and beyond. Google has made some changes to the way the Google Drive app works. If you are a teacher using iPads as a tool for learning, you might find this information helpful. Earlier this week, Google took away the ability to create and edit documents in the Google Drive app and turned that app into a place to access and view resources that are stored in the cloud. Along with that, Google released two new free apps, Google Docs and Google Sheets.